I've been a busy body lately with the house renovation but I have also been keeping busy by upcycling old pieces of furniture. I wanted to spruce them up a bit so they fit in with the decor in the new house. When Rust-Oleum offered to send me a few bottles of their famous Painters Choice spray paints (which I was already a huge fan of) it couldn't of come at a better time as I had numerous projects which I wanted to begin. As we have pretty much finished our house renovation and have moved in I have been focusing a lot more on dressing the house rather than just the home improvement side and it's been ever so refreshing. Our bedroom was one of the first rooms we needed to set up and sort through as of course it's one of the most important rooms in the house. 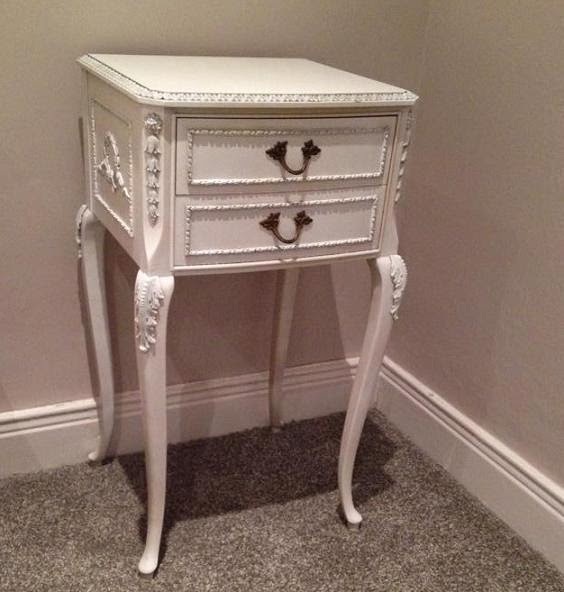 After we brought up the bed and dressed it I knew I had to dig out the shabby bedside tables that I had bought off ebay a few months back. 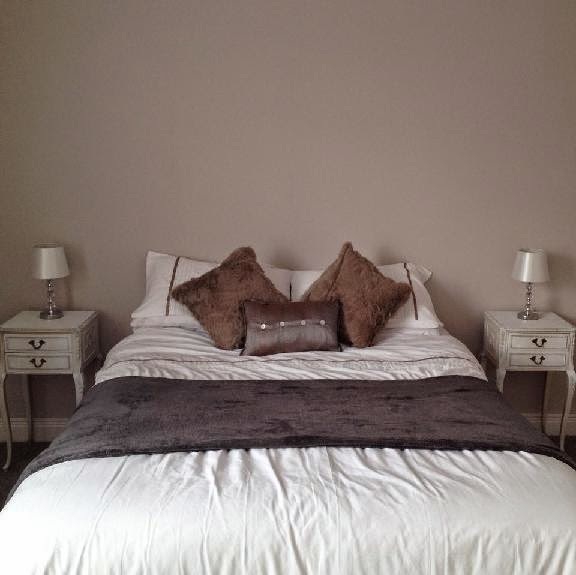 They were an aged cream colour and I knew that I wanted to repaint them white to fit into the theme and decor of our bedroom. There are multiple Rust-Oleum shades to choose from but for this upcycling project I decided to use the Rust-Oleum Painters Choice in White with the Matt finish. I didn't want to spend hours sanding down both bedside tables so I invested in some easy surface prep which is basically a tacky liquid which coats whatever surface you wish to spray or repaint. After cleaning the tables I slathered them in the ESP, wiped away the excess and waited 2 hours for it to dry. It's a wonderful product because it eliminates any need to sand and provides the perfect surface to begin painting. 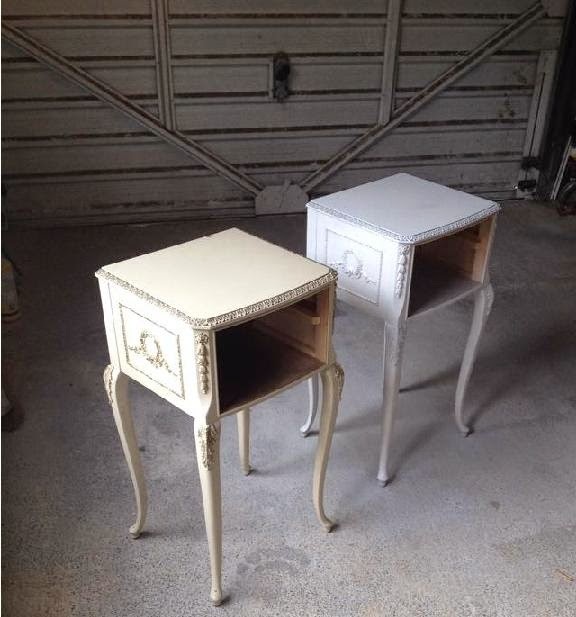 Once the tables had dried I removed the drawers and took off the handles with a screwdriver as I didn't want them to get covered in paint. I then took both tables and both sets of drawers into a suitable environment to spray. I chose to do them in our garage but if it was a mild day with not much wind I would of sprayed them outside. It was then time to start spraying! If you are new to spray paints then I would recommend you have a few tester sprays on some cardboard first. I didn't do that first off and I ended up spraying to close and it created big drip marks. It is also vital that you shake the Rust-Oleum for a good minute or two before you begin to use as this makes sure all the paint is evenly mixed. When applying I held the can back around 30cm as it coats more evenly and there's less of applying too much and creating drip marks or making mistakes like spray marks. 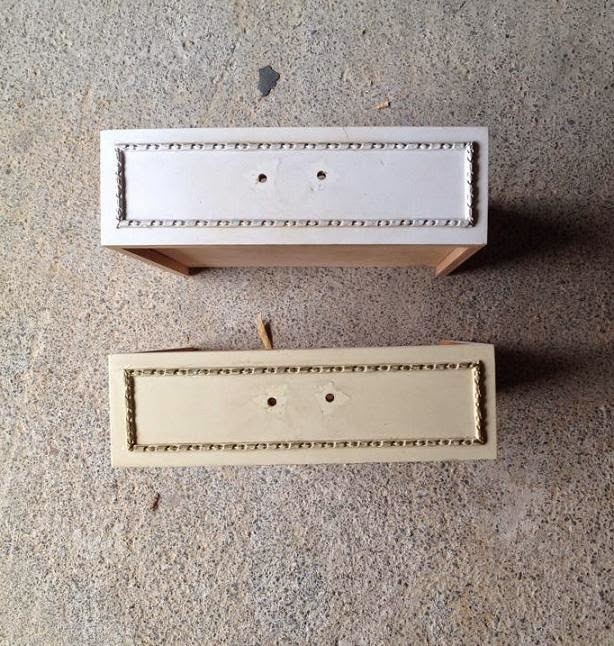 Less is really more when it comes to spray painting furniture. Apply a little and gradually build as you go. I like to apply in a sweeping motion as I find I achieve the best results. If you take your time with it and remember to shake and hold back the can you can achieve a flawless finish. It took me less than 30 minutes to spray the bedside tables which is invaluable when you have many projects to do and not much time on your hands. Rust-Oleum can be a little pricer than a regular can of paint when you are planning on painting numerous pieces but it makes upcycling so much easier. 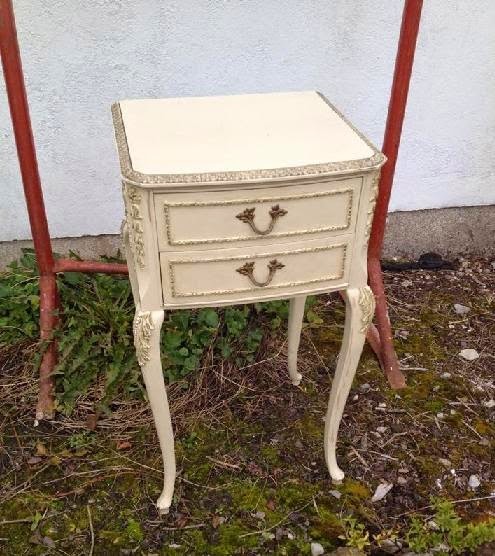 So much easier that I wouldn't hand paint a piece of furniture ever again! Noah loves food, there's no doubt about it. At just 10 months old he is already becoming a little foodie in his own right and will eat just about anything and everything. We are yet to find a food that he doesn't like and one afternoon when he sat there happily sucking on a lime we even wondered if he had any taste buds! 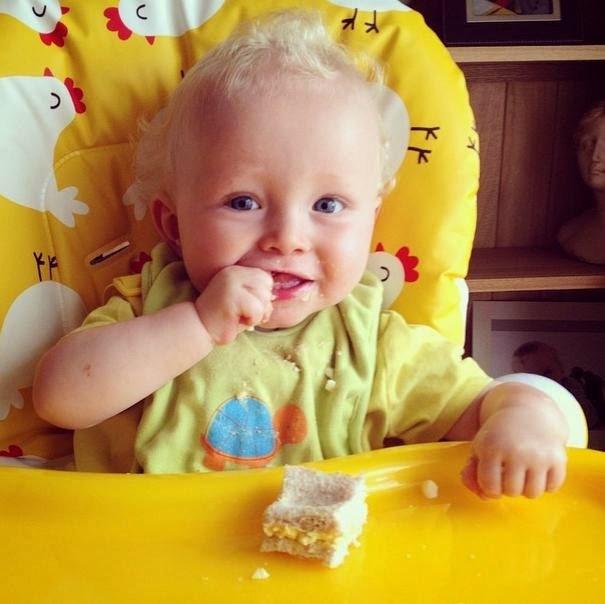 He really enjoys trying new foods, flavours and textures. 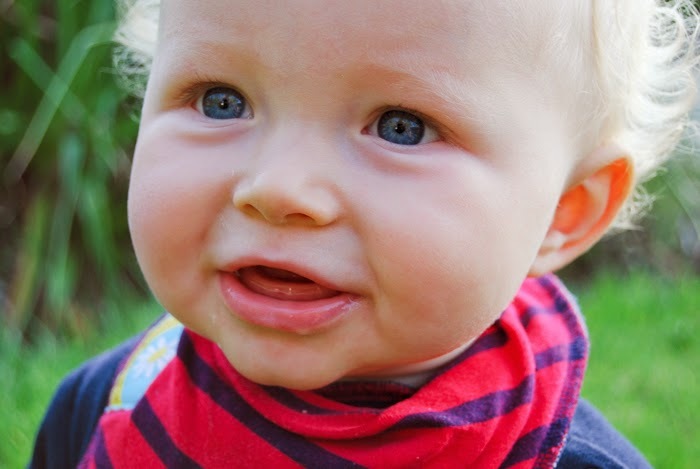 Considering he is yet to cut his first tooth you would be amazed at what his gums can manage to devour. 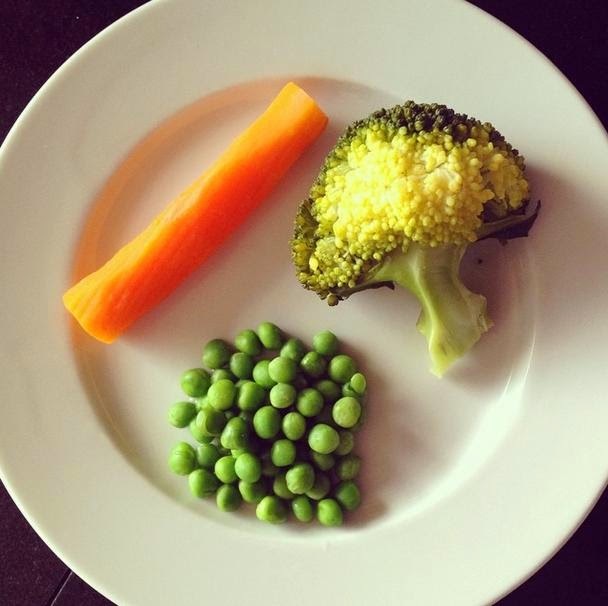 Our family has our fair share of fussy eaters and I knew long before I ever became pregnant that I really did not want a picky eater. 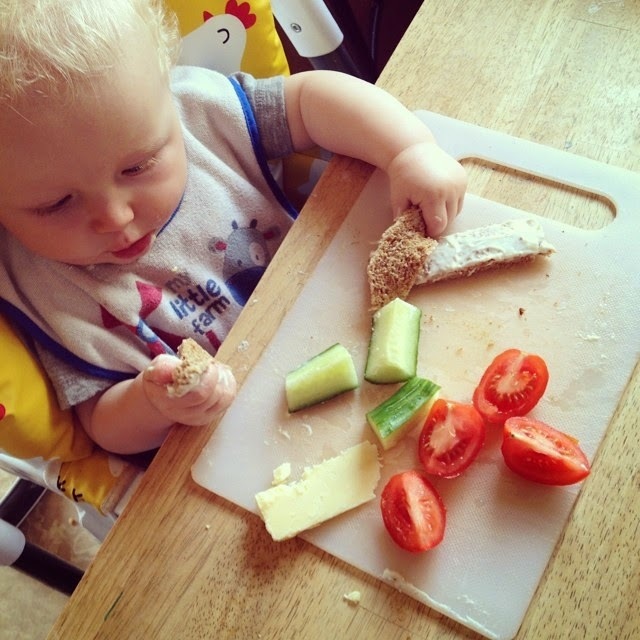 From the very start of our weaning journey I have always been conscious of what I feed Noah. I have always tried to offer him a lot of variety and introduced new foods often. The majority of his meals he now feeds himself and he thoroughly enjoys to do so. I am certainly no expert but I try to balance his meals the best that I can which is usually easy to do because he is a good eater. 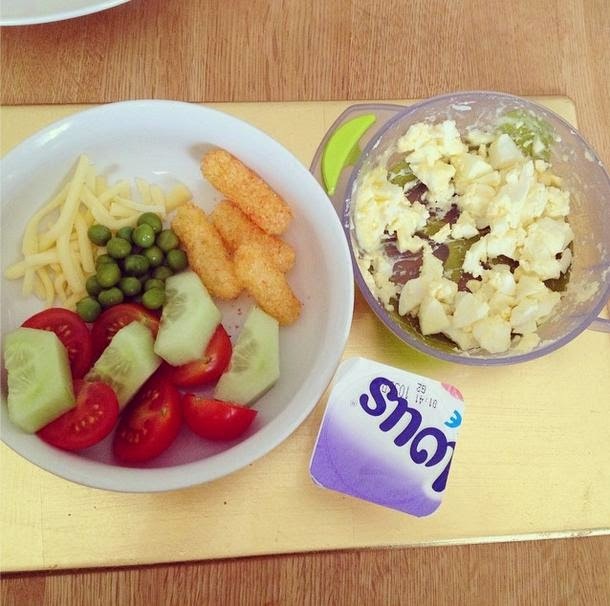 He loves his fruit and veg and his favourites are; strawberries, blueberries, grapes, peas, carrots and tomatoes. All the healthy eating aside I don't deprive him of any treats and he does have the occasional jaffa cake, biscuit or chocolate button! 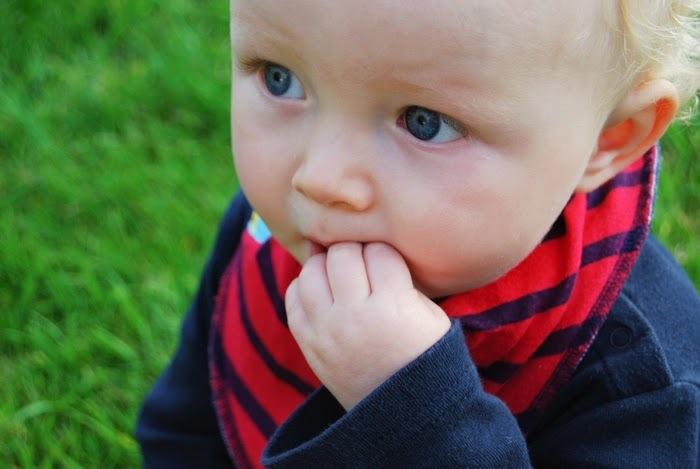 I am hoping that these healthy and positive food habits stick with him as he grows up. 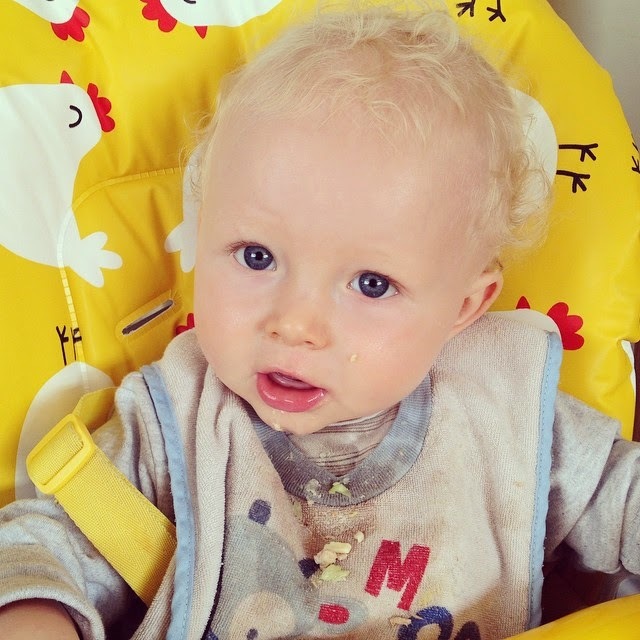 I know most children go through a fussy stage but here's hoping Noah doesn't because he's made a brilliant start! 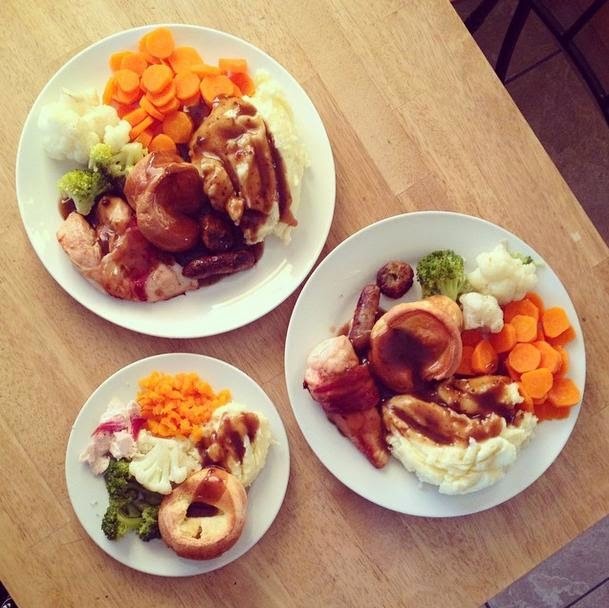 What are your babies favourite foods? 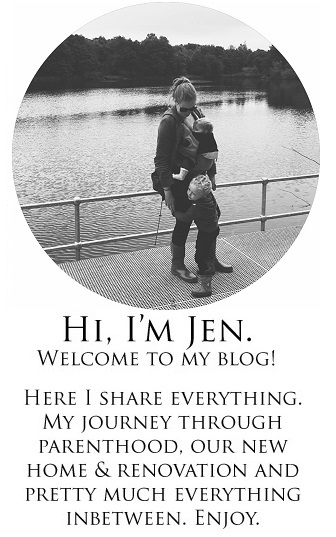 How did you find your weaning journey? Reading has always been a big part of my life and a passion that I want to pass down to my son. It looks like I have gott my wish because although Noah is only 10 months old he already loves books and reading is currently his favourite thing to do. Not only does he enjoy being read to but he also likes to look at the pictures and open, close and turn the pages himself. In case you missed it last month we reviewed our first month selection of books from the absolutely fabulous Routes to Reading book subscription service, which you can read here. Routes to Reading is a great concept. 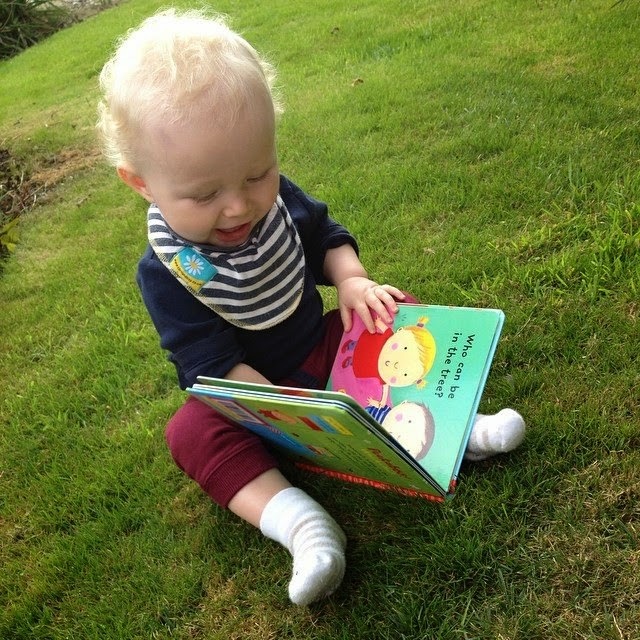 By subscribing to Routes to Reading your baby will receive hand picked books every month and the books are suitable for babies and toddlers up to the age of three. 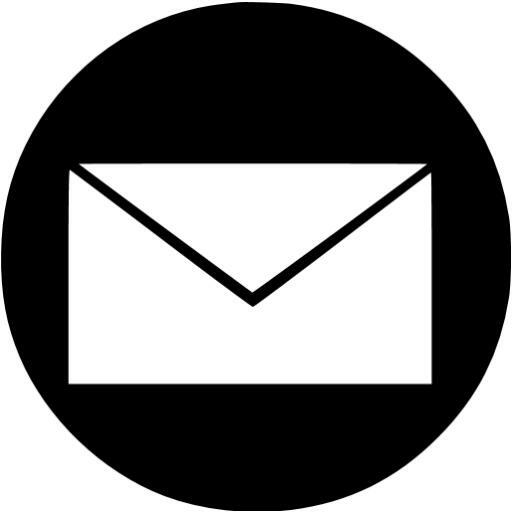 You can subscribe for 1 month, 3 months, 6 months, 9 months or 12 months which is great if you wanted to try it out for a month or two before subscribing for any longer. This month we received "Peekaboo, Who are you?" and "Five little Monkeys." 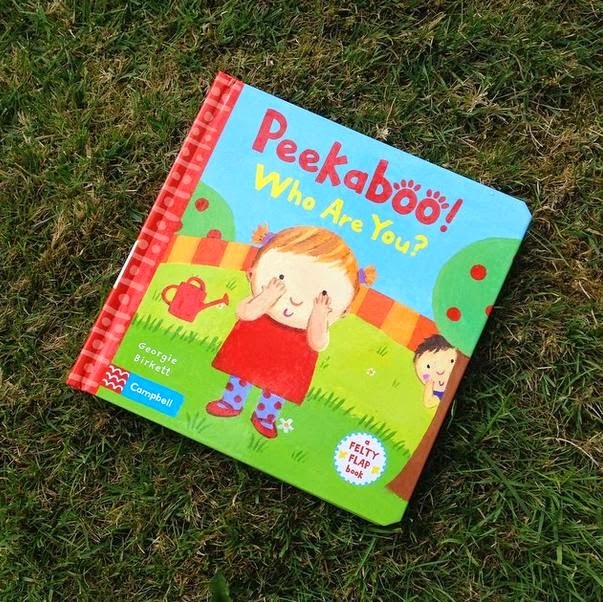 The first book, "Peekaboo, Who are you?" is illustrated in a bright and fun manner which really attracted Noah's attention. The book has felt flaps instead of card which I haven't come across before. 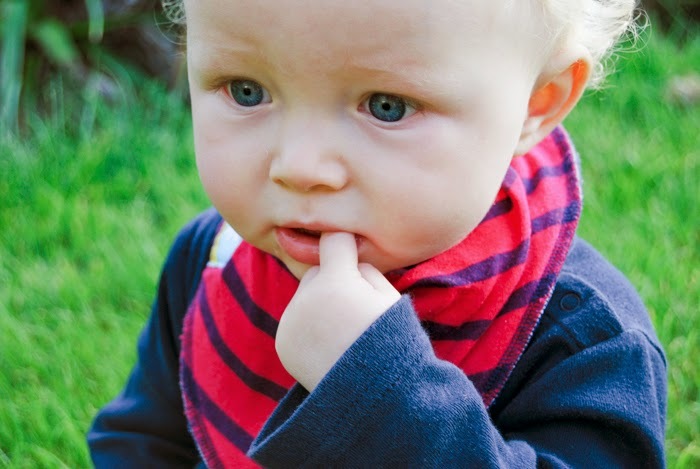 It's a great idea because the felt is tougher are ideal for clumsy baby hands. 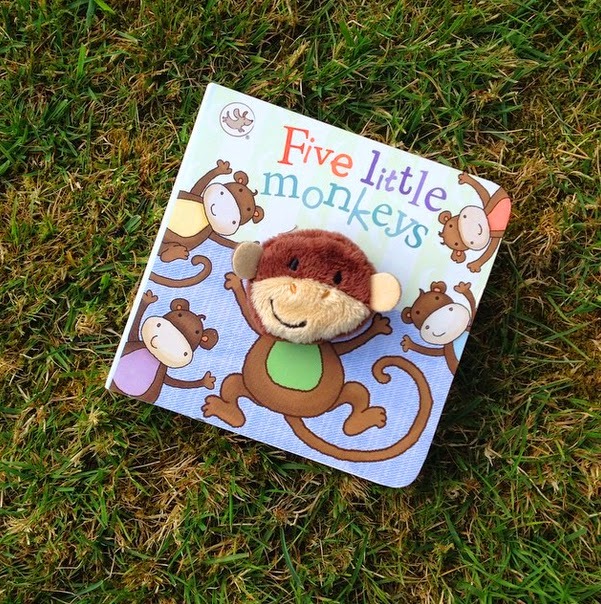 Our second book "Five little Monkeys" is a fabulous little finger puppet book. Noah found the monkey finger puppet hilarious and giggles so much when I tickle his chin with it. The book rhymes and it's a great book to sing to you little one whilst bouncing them on your lap. We adored both books as not only were they both suitable for Noah's age but they were lots of fun too! 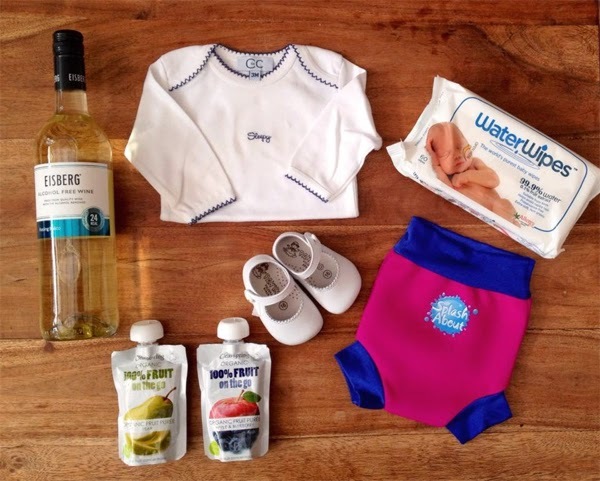 - Variety is the spice of life and this is true for the books you read with your baby too. 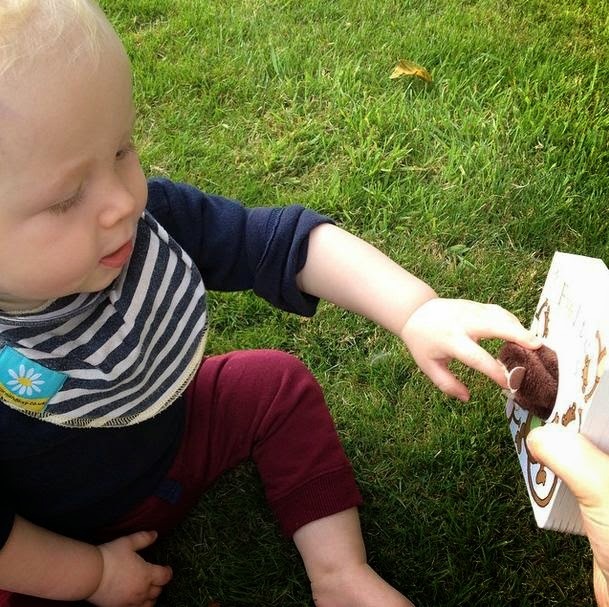 Choose books with puppets, flaps, tabs and sliders so your baby has something to interact with. 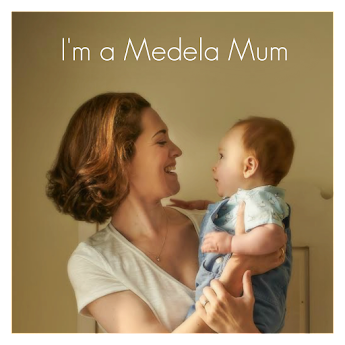 - Make books easily available to your baby, and use every opportunity to make up stories about what your child is doing. Your baby may have favourite books by now which you will be reading often and trying to find different ways to make exciting and fresh. - Continue to share nursery rhymes. 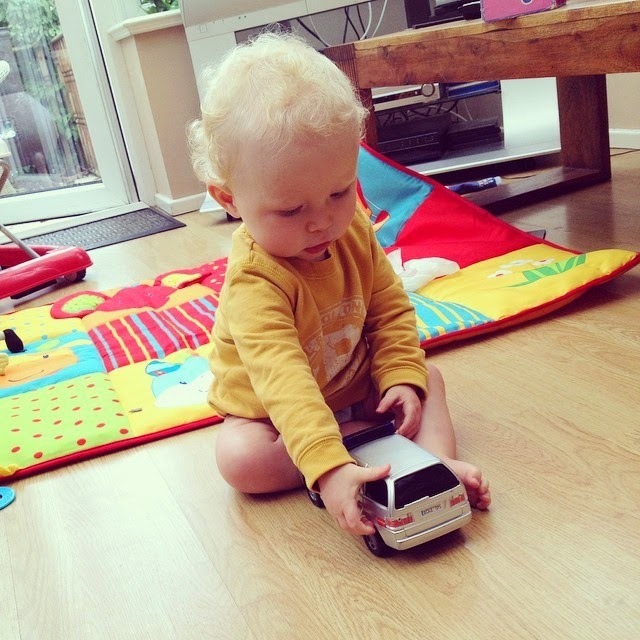 As well as saying or singing the rhyme, try and now use a favourite nursery rhyme book too. We were sent these books for the purpose of this review. However all opinions are my own. Last month a lovely email arrived in my inbox. 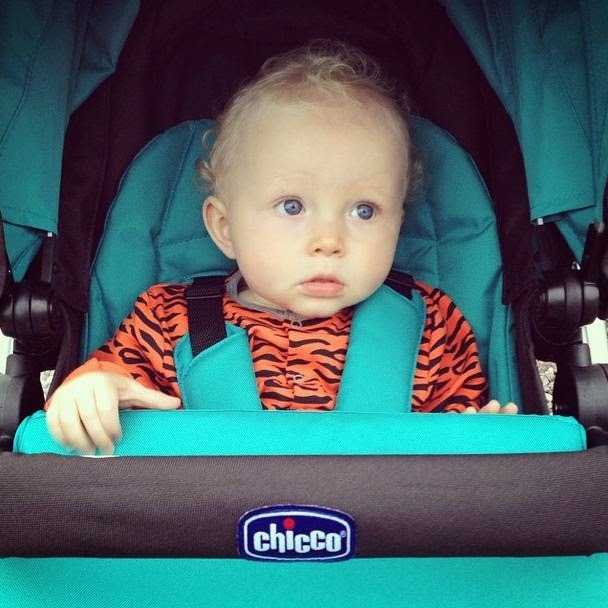 Noah and I had been lucky enough to be offered the chance to review the Chicco Urban Pushchair and our choice of colour pack. We gratefully accepted and it felt like the countdown to Christmas waiting for it's arrival. 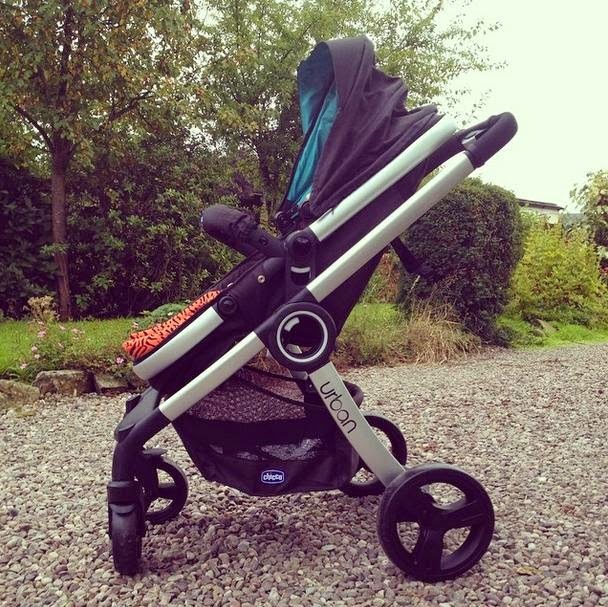 "Urban is an innovative, stylish and top quality stroller that offers an extremely versatile solution with many different configurations and features that can be personalised as mums and dads wish. 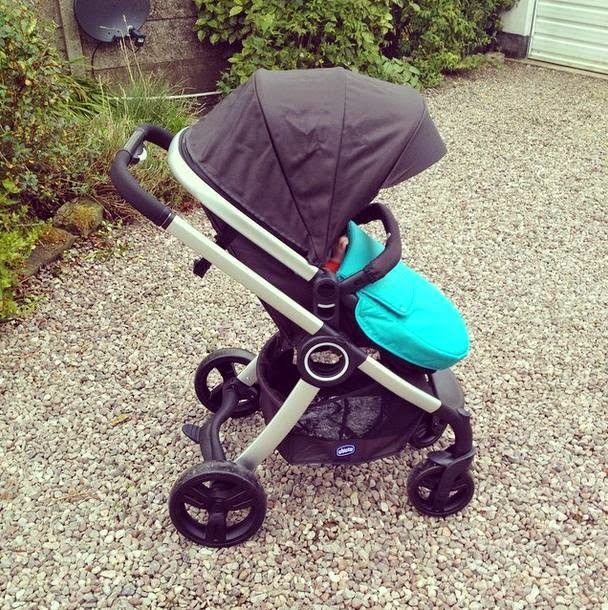 It is both lightweight and versatile as the seat transforms into a pram without the use of an extra carrycot, making it ideal for the modern family. The seat also easily converts from parent facing to forward facing and offers various recline positions. Suitable from birth up to three years of age, Urban can be also be fully customized by purchasing one of the additional bright or neutral colour packs meaning parents can change the look of their stroller without the expense of buying a brand new one. 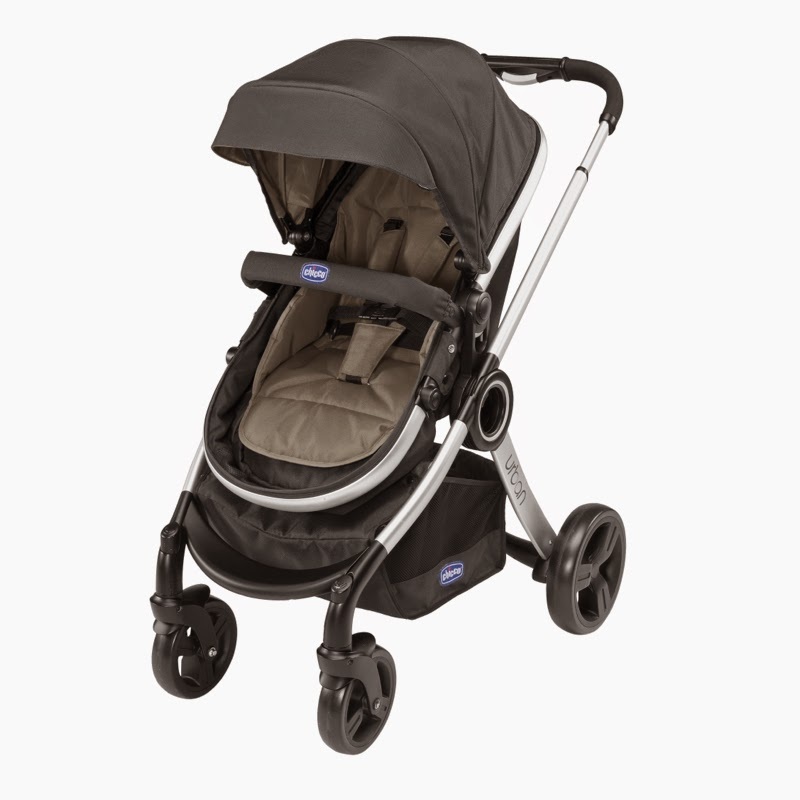 Other added features include a soft internal lining and a spacious basket." We have been using the Urban for a few weeks now and I have gotten a really good feel from it. 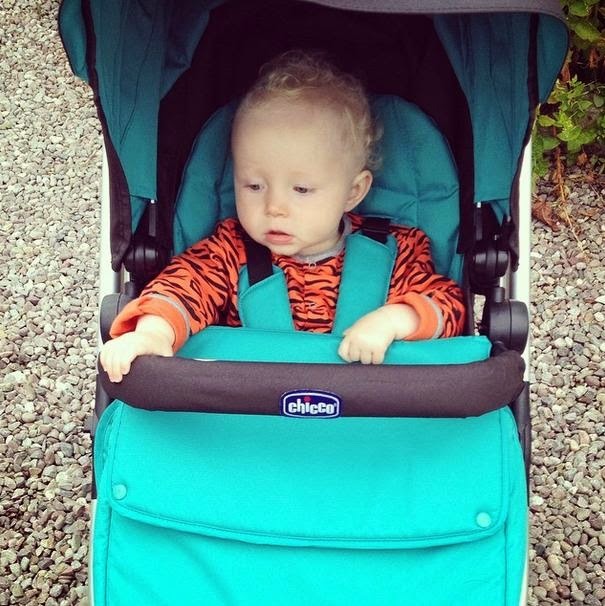 It's been a great pushchair and has suited our needs well. I find it to be the perfect pushchair for going shopping with as the pram is narrow enough to fit through cramped rows in the shops. I have found this a major problem in the past with our other pushchairs as they have simply been too wide. One pram doesn't even fit through out back door because the back wheels are too big! So kudos to Chicco on that one! The pushchair is parent and forward facing. 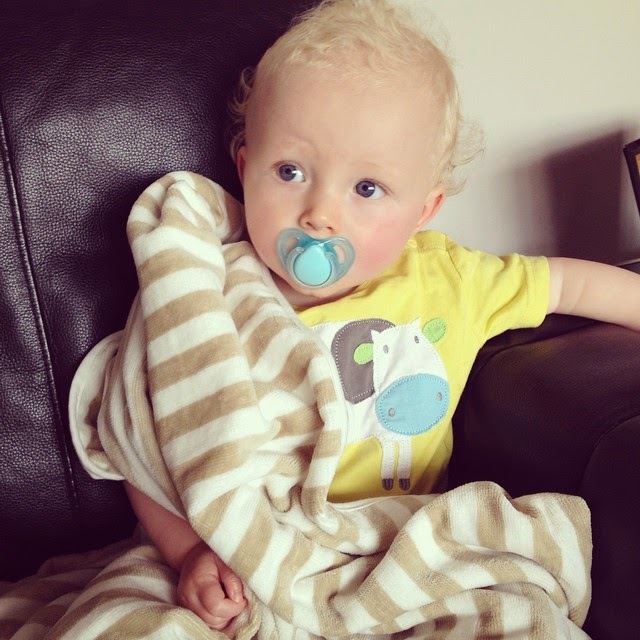 Noah has days where he wants to be facing out into the world but others where he wants the security of seeing his Mummy so that function is invaluable to us. The seat has multiple recline options and the back and leg rests are also adjustable. The seat magically transforms into a bassinet which I haven't seen on a pushchair before. 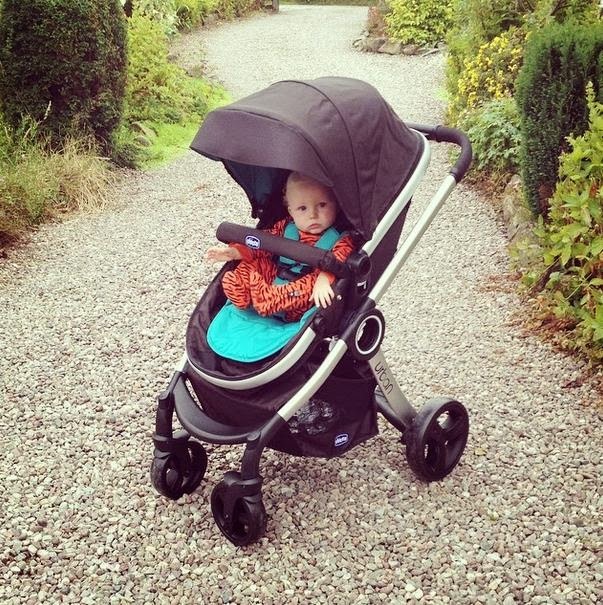 Not having to pay extra for a bassinet or carry around another part to the pram is fantastic. Although Noah is too big for a bassinet now it's something I will be using when we decide to have another baby. Simply genius. Comfort. 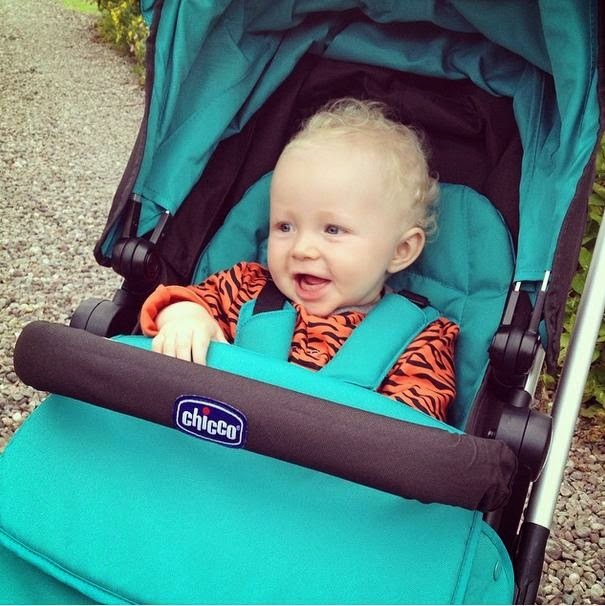 When Noah is in the pram you can see that he is happy and comfortable. I like how the pram supports him and he doesn't just look comfy but he is secure too. The extendable handlebar is another feature I look for in a pushchair as both my partner and I are tall. There are 4 adjustment positions and having that added height on the handlebar helps my posture and makes maneuvering the pram a lot easier. 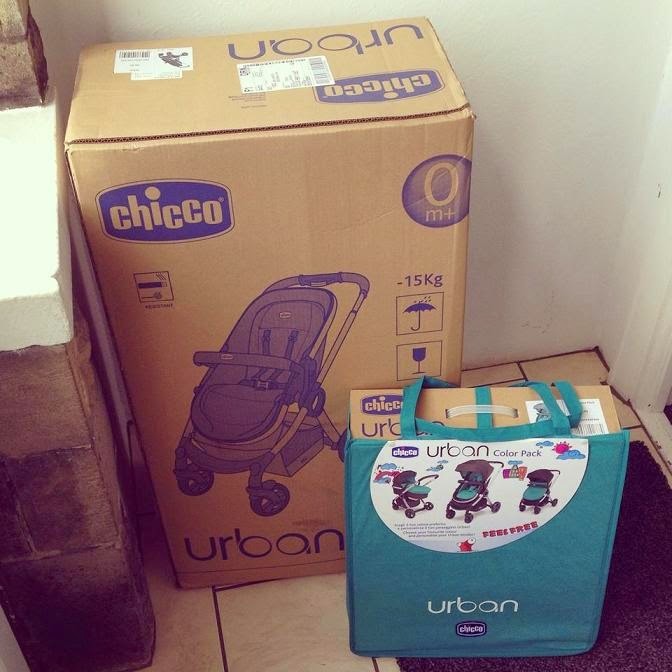 The Urban has a wide hood and a large shopping basket. When it comes to these two elements, the bigger the better! 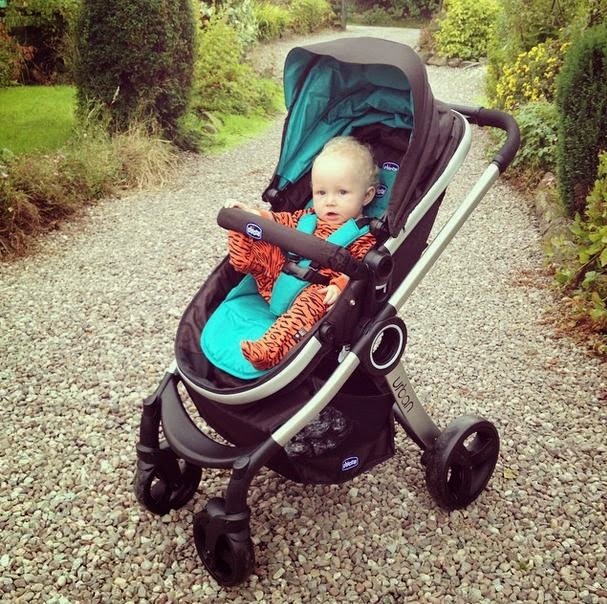 The hood has to be one of my favourite features on the pram. 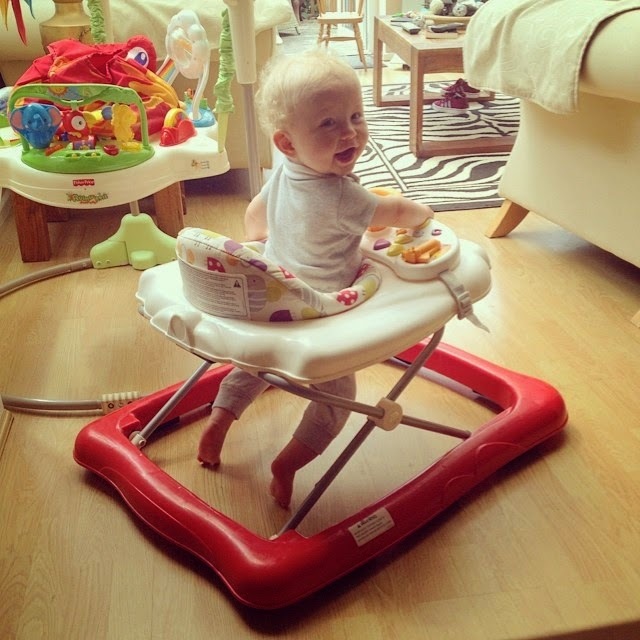 The bumper bar is removable which makes the job of putting a wriggly baby into the seat a lot easier. 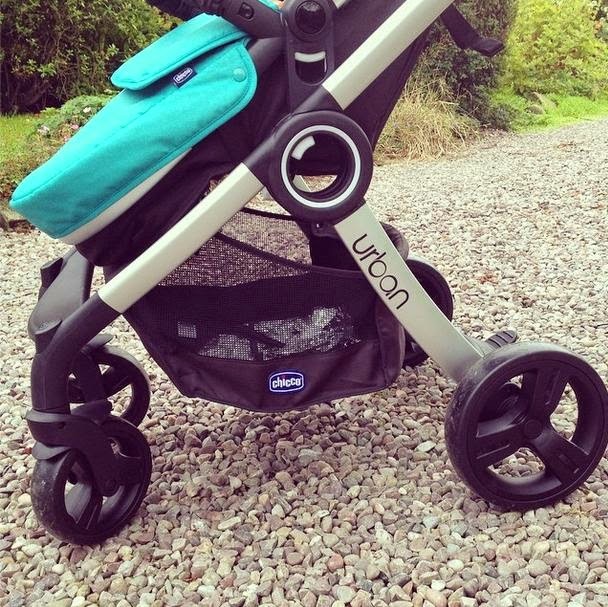 The pushchair also has fantastic front swivel wheels with shock absorbers on both back and front wheels. Maneuverability. Although the front wheels spin I find the back wheels to be fairly rigid. It took me a while to get the hang of steering it as it did feel a little stiff compared to my regular pram but I soon got used to it. The need to remove the seat to fold the pram can be a little impracticable at times. It takes two hands to fold up the pushchair which isn't really a problem but it isn't always feasible when you are hold of the baby. Especially when you need to remove the seat first and then fold the chassis with both hands. Sometimes you have nowhere to put the baby! The seat/leg cover has no buttons on the underneath so when it was on Noah soon learned he could just keep kicking it up. Disclaimer: We were sent this product for the purpose of this review. However all opinions are my own. My son Noah has had a comforter since the day he was born. 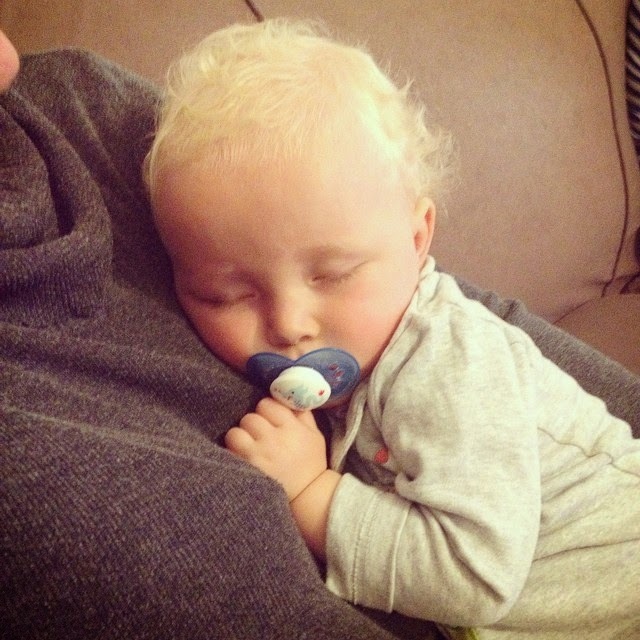 He has always loved to snuggle up to something cosy when he's sleeping, it's very cute. That being said he is very picky when it comes to his comforters and we have been through a dozen to find the perfect one. His two favourites are an American brand called "beansprout" and he is obsessed with them. We call them his kiki's (don't ask!) The minute you hand him one his beloved kiki's his eyes begin to roll, he will rub it across his face and instantly want to settle. 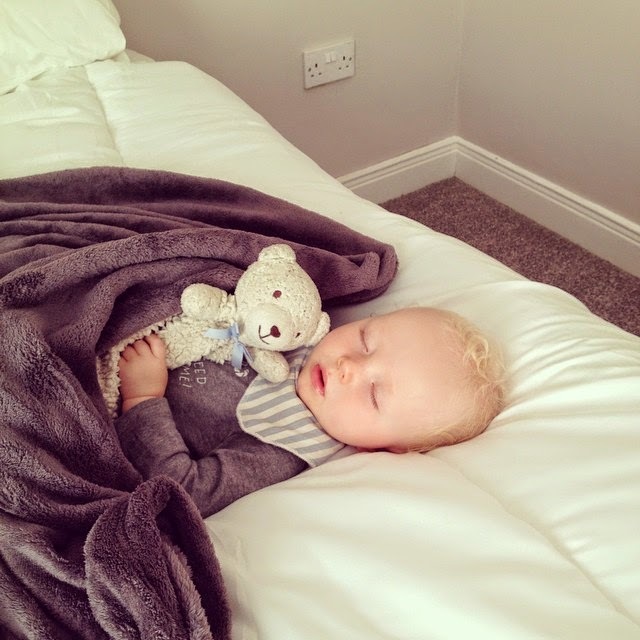 I recently received two Snoozebaby Comforters which Noah is very fond of. 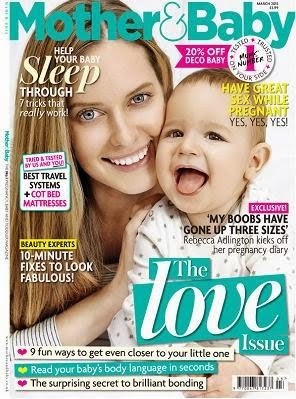 But of course Noah doesn't need both so I thought I would give one away in a competition. I hope the winner has a baby who will enjoy it just as much as Noah does. All you need to do to enter is use the Gleam form below. Good luck! Okay now this is getting scary, 10 months old. 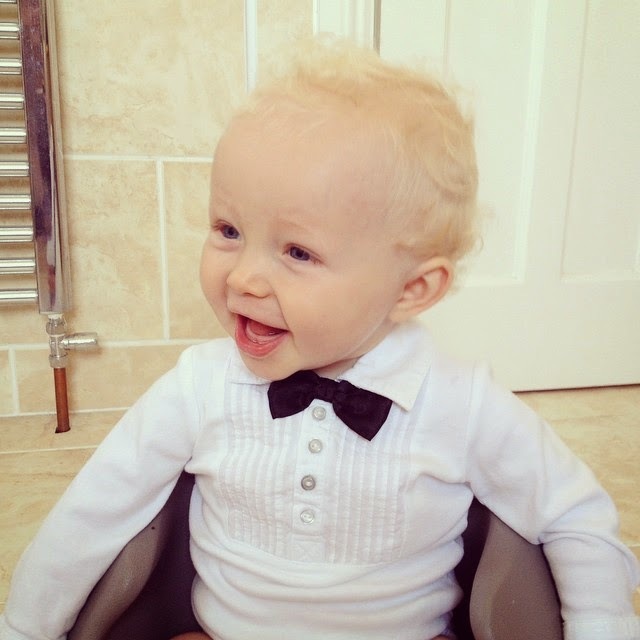 You are now in double figures and in 2 months time you will be 1... I feel like sobbing a little! 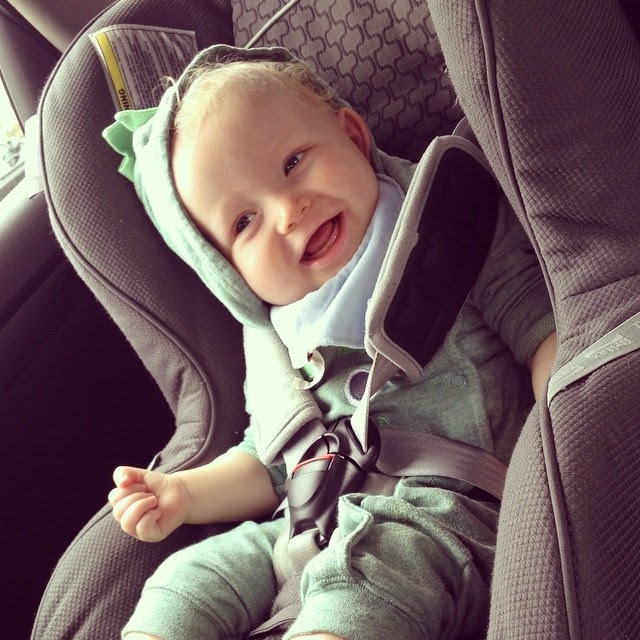 Ever the cheeky, happy and excitable boy that we know and love. You are so much fun but there have been days where you haven't been your happy little self and have been much harder to please. This month your bossy and feisty side has really shone through! I don't know where you get that from *cough cough* You aren't just becoming more strong minded but you are also becoming more loving too by giving me lots of cuddles on a daily basis. You haven't been weighed this month but I would guess that you are now into the 20lb mark as you have really bulked out lately. You still have long and skinny limbs but you are solid. 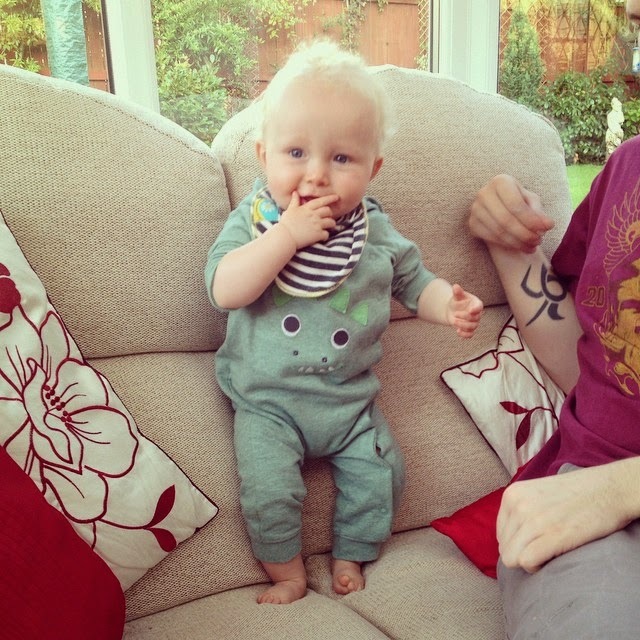 You now wear 9-12m in trousers and babygrows but still fit into 6-9m in tshirts and jackets. You wear size 4 nappies. This month hasn't been the best when it comes to your health. Nothing major but you have had the occasional cough and cold. You have had a horrible vomitting bug too which not only lasted a couple of days but put you off your food for a week or two. There were two nights where you woke choking on your own vomit and it was terrifying. 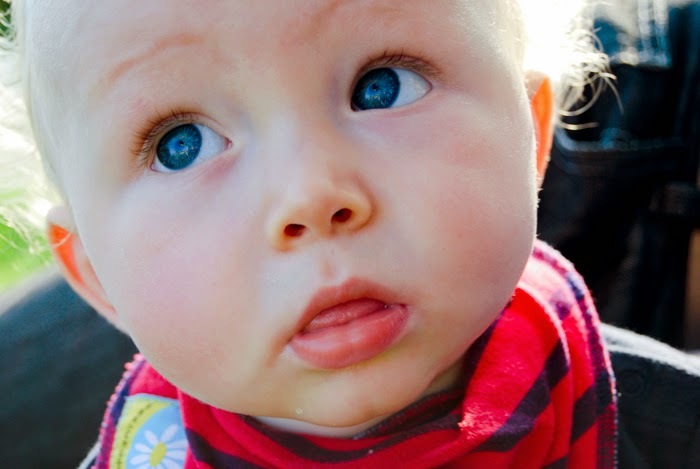 You still have no teeth but have been showing more signs of teething. I think by our 11 month update we will have a tooth or two. Nothing has changed when it comes to feeding. You still have x3 5oz bottles a day, around 8oz of water and 3 meals a day. You still adore your food and your new favourite this month is egg mayo sandwiches! You love to feed yourself and sometimes refuse to be spoonfed which isn't ideal when it comes to porridge! You mainly eat what we eat now and you really enjoy sitting down at the table with us. Sleep has been hit and miss again this month. You are now in another huge leap and these leaps always upset your sleeping pattern. You usually sleep 8pm-8am with 1 feed at around 6am. 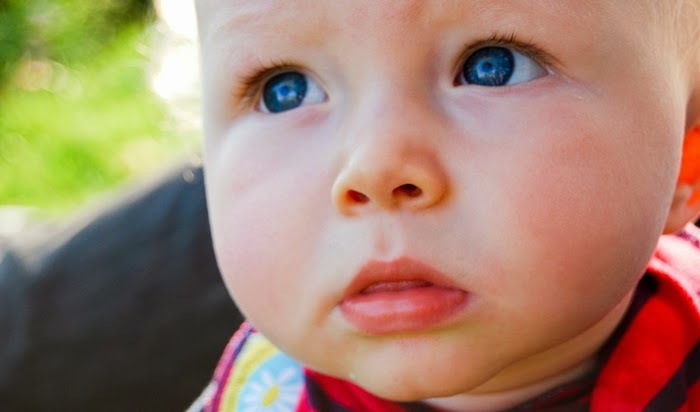 You used to be able to sleep right through without waking for a bottle so I don't know if you are now just used to having this feed or you are hungry. I think having the vomitting bug and choking on your own sick in the middle of the night two nights running had a negative effect on both bedtime and naptime. After those incidents whenever I would try to settle you you would end up hysterically crying and it took a few days for that to stop. - Speech. You now know the meaning to some of the words you say and you say them in context. Words such as Mama, Dada, Nana, Hiya. - Knowledge. 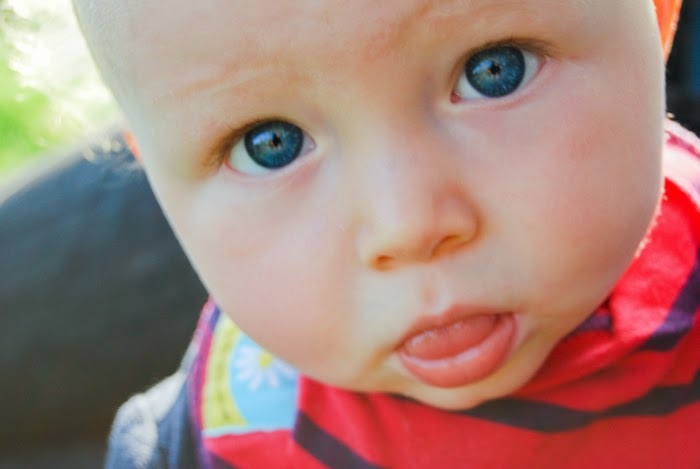 You are a very clever baby and I have only really realised this month how many words you actually know. 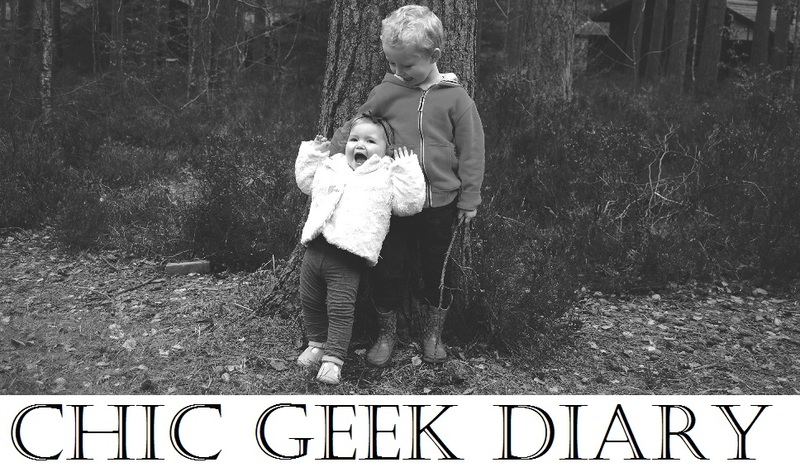 For example if I say "Take your dodo out" and you will look at me, think about it and then take it out. - Pointing. Now when I ask where certain things are you won't just look at them but you will point too and make a "uh" noise. - Crawling. You aren't crawling yet but I think it could be any day now. You can now get yourself from the sitting position into the crawl position and try to move. You usually flop down onto your stomach but you are trying. 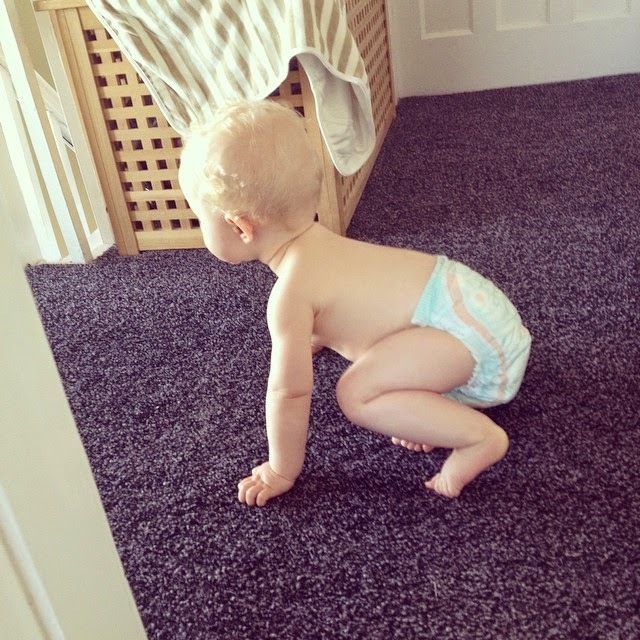 Whenever you are sitting you always make an attempt to crawl. - Kneeling. You can now get into the kneeling position from sitting. - Standing. 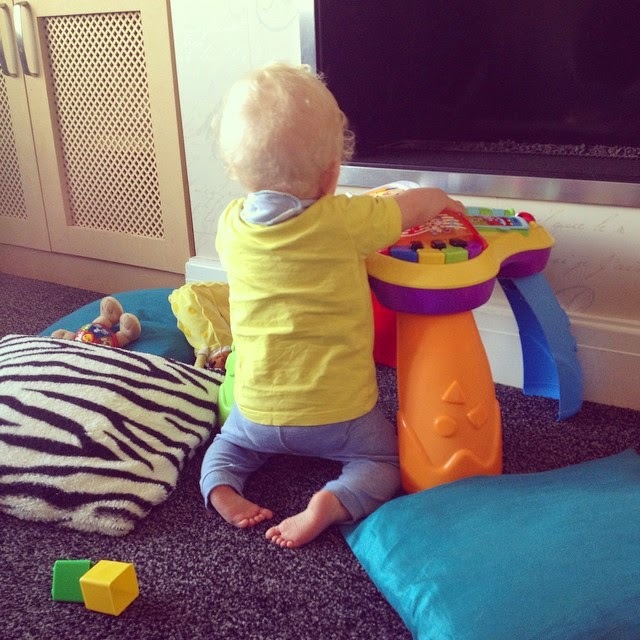 You are getting better with standing now. We dug out a play table we were sent a while back and have been practicing on that. 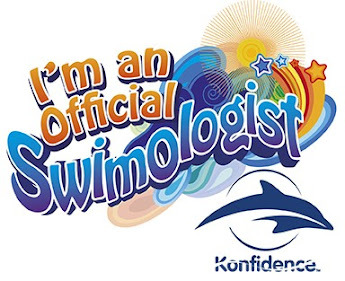 In just a week you have gotten much more confident. - Movement. Although you haven't mastered how to crawl yet you are never still. Whenever you are sat down you are always attempting to crawl or reaching for something or other. - Waving. You learnt to wave last month but we don't need to ask you to do it anymore you do it all the time. You can also clap, dance, point, kiss and cuddle when we ask you to. - You have learnt how to fake a laugh and do it all the time! Along with your fake cough! - Doc McStuffins. The Doc has become one of your favourites this month a long side Spongebob. 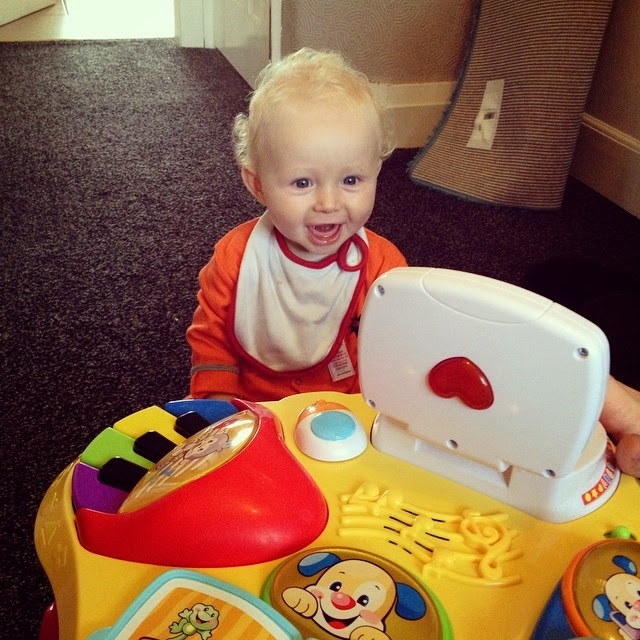 I have learnt the words to all the songs so I can sing them to you and you get so excited! "Time for your check up, time for your check up!" - Butties. 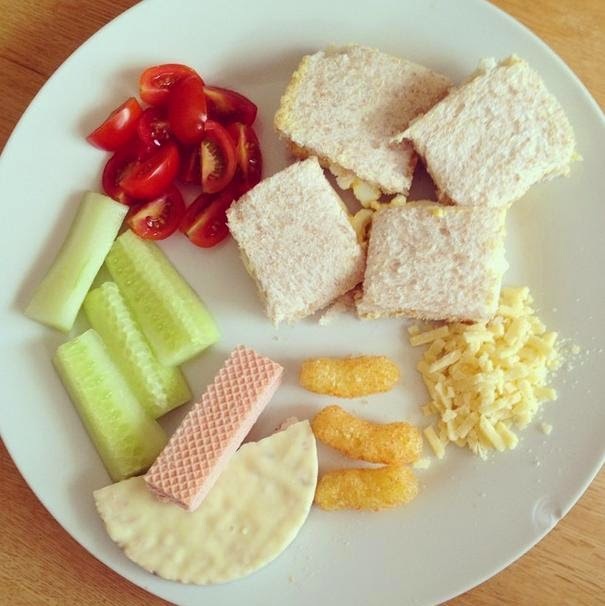 You had your first proper sandwich this month and you devoured the whole thing in a matter of minutes. - Books. You love to be read to and find books very funny too! - Nap times with Mummy. You sleep so much better when I'm curled up beside you. 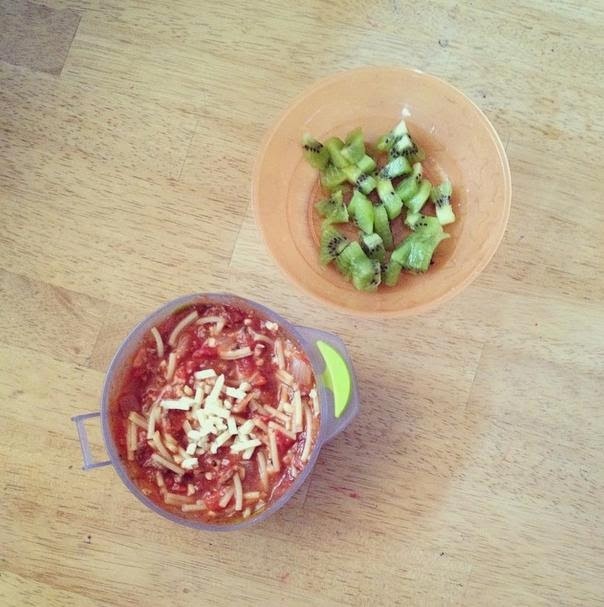 - Food. Especially fruit and any food that you can feed yourself. - People watching. Your stranger anxiety seems to have mellowed a little this month and you seem a lot more confident around other people. You are really interested in people and what they are doing which is no surprise as you never miss a beat! - Diet coke cans. As soon as you see one of those shiny silver cans you try to grab it and get very excited. You are like a little magpie and like shiny things. - Music and musical instruments. You love to listen to Daddy play guitar and anything musical you will dance to. My musician in the making. - The vac, the hairdryer and the mop! Simple things make you giggle. - You always have a good whine when we clean your face or your ears. - Being cleaned after a meal. 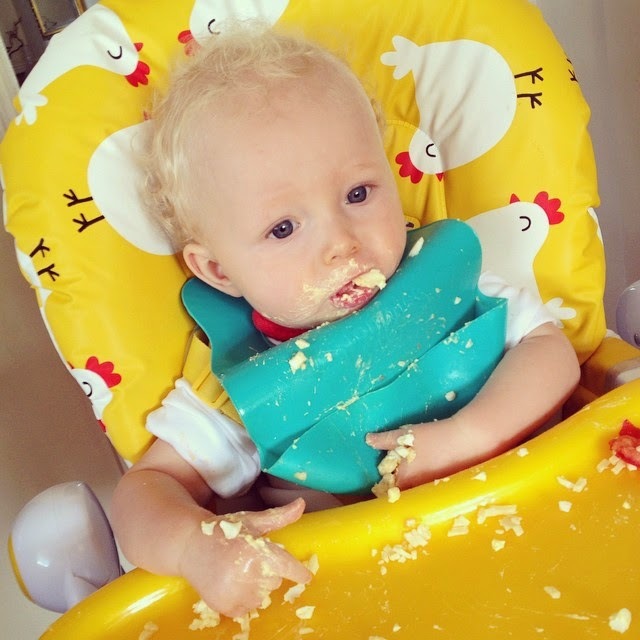 Which is totally unavoidable when you let your 10 month old baby feed themselves! 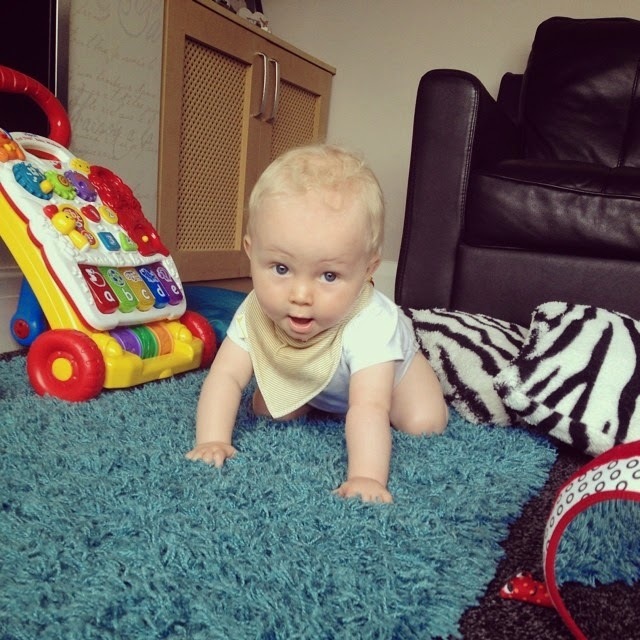 - Not being able to crawl. 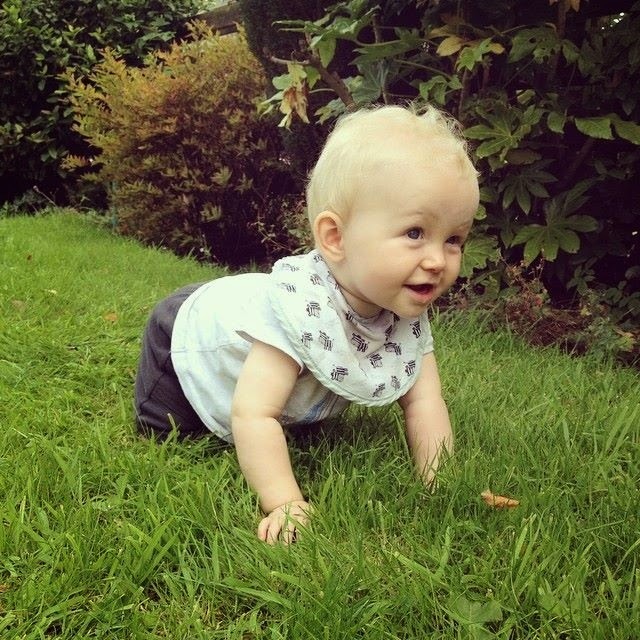 You are really trying to figure out how to crawl and you get so frustrated that you aren't able to move about yet. Poor baby. 2. He was induced and born 3 days before his due date on the 12/11/13. 3. His birth weight was 7lb 2oz and didn't lose any weight on any of his weigh ins. 4. Noah was the only name we both liked and agreed on. 5. His middle name is Nicholas which is his Daddy's first name. 6. He was a planned baby. 7. He slept through by 12 weeks old. 9. Other than mama and dada his first word was hiya. 10. 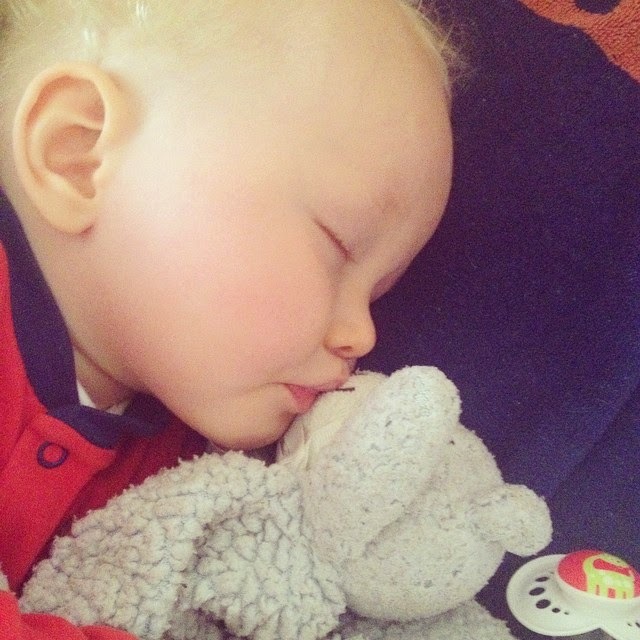 He is besotted with his two teddy bear comforters which we call his "kiki's"
11. 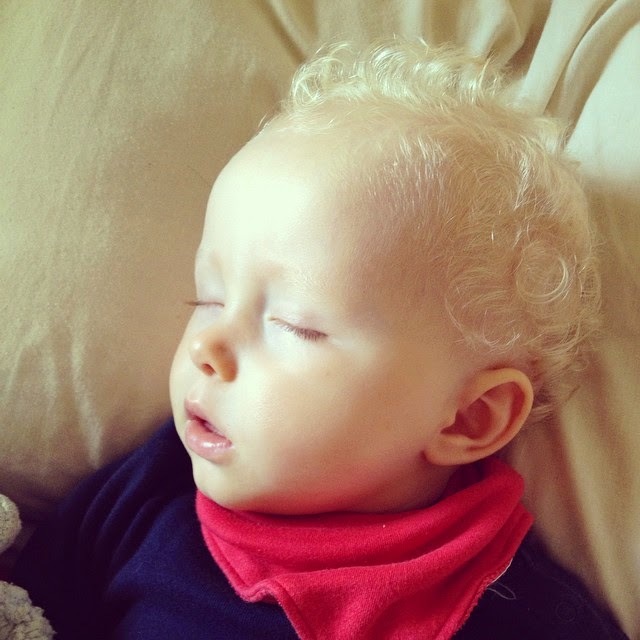 He has curly blonde hair and bright blue eyes. 12. He's been obsessed with Spongebob Squarepants for since he was about 3 months old. 13. He is very lazy when it comes to mobility and would rather you get him to where he needs to be. 14. He loves his food and I am yet to find something he doesn't like. 15. His favourite foods are; strawberries, peas, cheese and tomatoes. 16. He is a lover of books, already. 17. He is a performer and will do things to make you laugh. 18. Noah isn't crawling or cruising yet. 19. He loves being sung too and will clap and dance. 20. 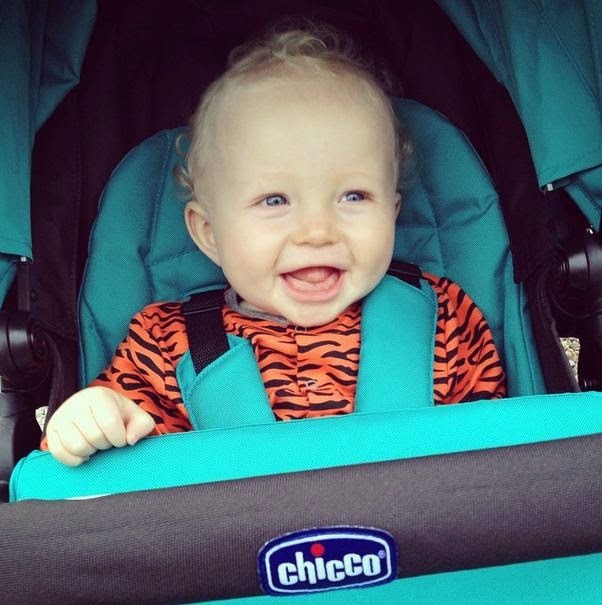 He is generally a very smiley and chatty baby but can be very bossy too! A few people have tagged me in this post and I really wanted to do it, so there it is. I tag whoever would like to do it too! Being a Lancashire lass Blackpool has always been our go to place as soon as the sun makes an appearance. I have been visiting for as long as I can remember and remember vividly how excited I would be when my parents would tell me we were off to the seaside! Now I am a parent myself I can't wait for my son to get just as excited at the prospect of the Blackpool tower, donkey rides and rock! 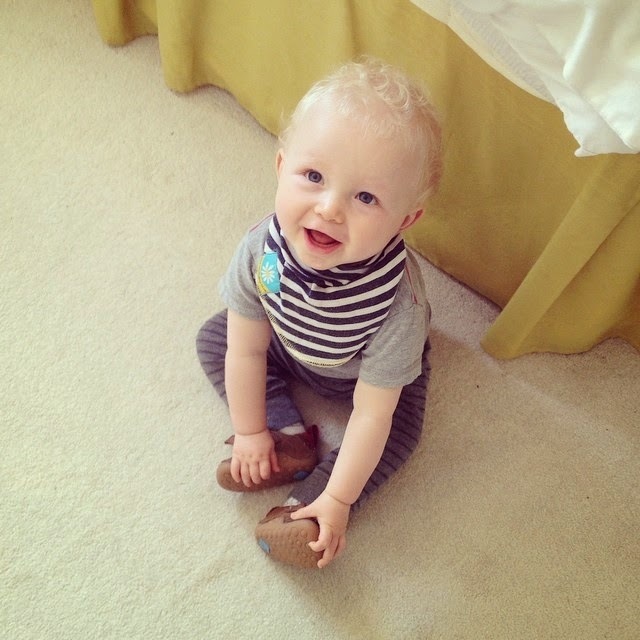 Although Noah is still very young we took him to Blackpool for the first time a few months back. I know there's no chance he will remember his first seaside experience but we took lots of photo's for him to look back on. There are so many different things to do in Blackpool and it's a place that is suitable for all the family. One place I have always wanted to visit is The Blackpool Tower Dungeon. 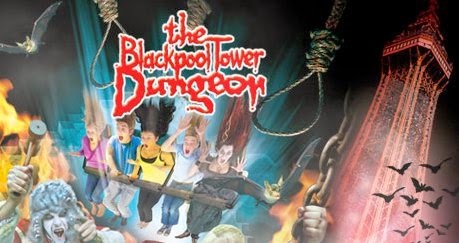 "The Blackpool Tower Dungeon brings together an amazing cast of theatrical actors, special effects, stages, scenes and a ride in a truly unique and exciting walkthrough experience that you see, hear, touch, smell and feel. It’s hilarious fun and it’s sometimes a bit scary. We're the black comedy of attractions; dark, atmospheric and very, very funny." I'm pleased to announce that I have been offered the chance to give away a family ticket to The Blackpool Dungeons to one lucky blog reader. The prize is a "family ticket" but it is 4 tickets and they can be used in any which way. So here's your chance to enjoy Blackpool just as much as we do! All you need to do for your chance to win is to use the Gleam entry form below. Good luck!